My travel companion on the train was a dentistry student from Iran studying in Budapest. She was touring cities in Eastern Europe with her family who was over for her graduation. She was unsure of what she wanted to do and where she wanted to live. I slept for the first hour of the journey as we passed through the Slovak countryside, waking up only when we were fairly to the south. We crossed over into Hungary at Esztergom with the mighty Danube sparkling to the right and the Esztergom Basilica looming over the river bend. Of course I didn’t know what it was then but was suuitably impressed. We passed Visegrad and Vac. When we arrived in Budapest, I said goodbye to my travel companion and dragged my suitcase, booking a taxi using a number my companion had given me. Budapest Keleti Palyaudvar or Keleti station is another example of fine architecture. One way to Budapest please! There’s something poetic about saying goodbye to a city in the back of a taxi with a sad song playing and gloomy weather around. Goodbye city with Central Bank in a skyscraper and a helipad on top. On the other hand there is nothing poetic about a piglet on a leash in front of you at the Bratislava central train station. It’s amusing though. The hotel seems to have broken my suitcase’s delicate handle. Not an auspicious start to the trip. Still it’s funny in a way.. I remember how once many years ago I said, “even I want to travel to all these exotic places – Bratislava and Budapest and all”. Someone said, well you may want to go to Budapest but you may want to reconsider Bratislava. I didn’t really know anything about either. I haven’t had any stronger reasons for wanting to visit them other than this. They were to me symbolic of places off the average Indian’s travel map, well atleast at that point of time. They represented East Europe to me along with Czech Republic and Poland. So now I know slightly better – this is Central and East Europe. And all these destinations are part of the Visegrad group of countries. After meetings today, we went in search of a restaurant along the river. It was raining when we left but we didn’t listen to the doorman’s advice to get umbrellas and pushed on in the warm rain. The wonderful warm rain and the damp smell of the earth. So unlike the miserable cold rain in London. The rain drops were fat and heavy. We walked along the city, the Hapsburg architecture giving way to some more communist-era building blocks. Tram lines criss-crossed the city. The rain got heavier and we walked on getting wet. I covered my head with the newspaper I picked up from the hotel and refused to get wet any further after a point taking refuge on the steps of a gorgeous old building. We sat there for a bit, watching cars go by, thunder and lightening overhead. After a while, the hunger pangs returned and we pressed on towards the river. The Danube was fast flowing and grey under the overcast sky. We walked on grass towards some restaurants and I took my flip flops off. During dinner, I felt that old familiar feeling of not knowing anything and everything feeling foreign again and I struggled to make engaging conversation. 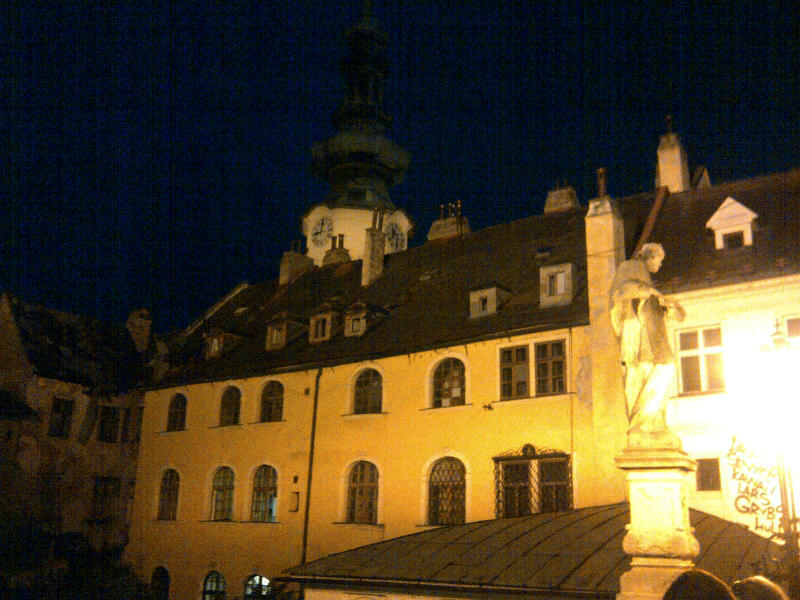 Post dinner, we walked back towards the hotel, and wandered about in the cobbled streets of the old town. I saw the silhouette of a cat sitting in one of the windows. The room was darkened and the inhabitant must be watching TV because of the flickering light on the walls. The cat appeared to be looking at the TV and not outside the window.